Jack Nickerson and his faithful lab, Sinbad, wake early one snowy Cape Cod morning, ready for winter fun. Meanwhile, miles away in the ocean, the crew of a cargo tanker ship called the "Pendleton" is in serious trouble. The waves and wind of a raging nor'easter rip the tanker in two, leaving the people to cling for their lives in the wicked, cold storm. 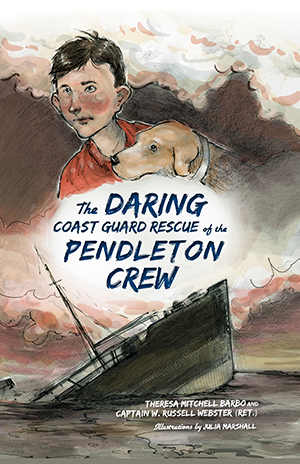 There's no time to waste--the Coast Guard, including Jack's friend Bernie Webber, leave Chatham Harbor in search of the "Pendleton" crew. They don't yet know that Jack and Sinbad have snuck aboard the rescue boat as stowaways. Join the young duo in the front-row seat for the greatest small-boat rescue in American history. Journalist, author and historian Theresa M. Barbo is the author of six books of historical non-fiction published by The History Press. Barbo is a noted public speaker throughout New England and a former award-winning broadcast journalist and news magazine history editor. She is also a former executive in the non-profit sector. Captain W. Russell Webster retired in 2003 after 26 years of Coast Guard service. He served as Group Woods Hole rescue commander from 1998 to 2001. He also served as the Coast Guard's regional operations officer for the September 11 terrorist attack responses. In 2008, he became FEMA's first New England Federal Preparedness Coordinator. Julia Marshall is an artist and illustrator living in New Orleans. She holds a BFA in Illustration from Savannah College of Art and Design. Learn more about Julia at JMarStudio.com.